Reprocessing is a regulated activity for manufacturing the medical devices that are conducted by third party or hospitals. The US Food and Drug Administration (FDA) requires third-party reprocessors to meet the same standards as originally manufactured single-use devices. Reprocessing is a common practice in the U.S. after the advent of “Honor Roll”, where hospitals were supposed to choose to reprocess single-use devices and 77% of Practice Greenhealth Award winners in 2010 chose to reprocess medical devices with a combined savings of over USD 10.8 million. “Superbug” is the antibiotic resistance that is said to be associated with drug only while the medical device is equally responsible for it. Around 45% of hospitals had agreements with third-party reprocessing companies which increased to 70% in 2008 after the economic recession in the U.S.
Goldstein Research analyst forecast the reprocessed medical devices market size is set to reach USD 5.12 billion by 2024, at a CAGR of 15% over the forecast years. Currently, most hospitals and healthcare facilities outsource reprocessed medical devices to qualified third party service providers. The report covers the present ground scenario and the future growth prospects of the Reprocessed Medical Devices market for 2016-2024 along with the data of shipments of reprocessed medical devices centers worldwide. We calculated the market size and revenue share on the basis of revenue generated from major players across the globe. We have forecasted the market on the basis of the number of clinics, hospitals, specialty centers and medical labs and the average number of installments of the reprocessed devices in the facilities. Based on reprocessed medical devices, cardiovascular devices hold the largest reprocessed medical device market share (i.e. 45%) followed by general surgery medical equipment (i.e. 22%) owing to the reduced pricing of the products, high usage and growing pressure to reduce healthcare expenditure. Orthopedic and gastroenterology tends to be the highest growing segments and dominate the reprocessed medical device market in future in order to protect the environment by reducing medical waste being dumped in landfills. Reprocessed Medical Devices Market Outlook 2016-2024, has been prepared based on an in-depth market analysis from industry experts. 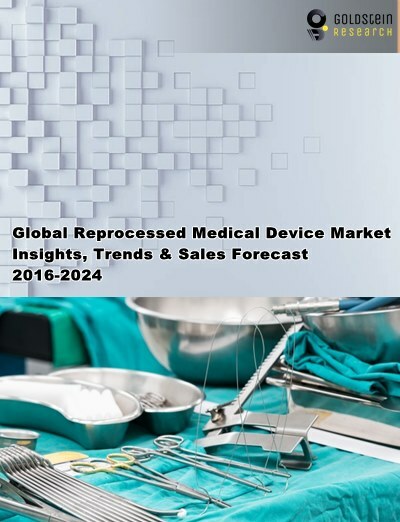 The report covers the competitive landscape and current position of major players in the global Reprocessed Medical Devices Market. The report also includes Porter's five force model, SWOT analysis, company profiling, business strategies of market players and their business models. Global Reprocessed Medical Devices market report also recognizes value chain analysis to understand the cost differentiation to provide a competitive advantage to the existing and new entry players. Our global Reprocessed Medical Devices Market report comprises of the following companies as the key players: Centurion Medical Products Corporation, Hygia Health Services, Inc., Medline ReNewal, MidWest Reprocessing Center, ReNu Medical, Inc., Ethicon, Inc. (Johnson & Johnson), Stryker Sustainability Solutions, Inc., SureTek Medical and Vanguard AG. According to the report, major driving factor for reprocessed medical devices market is the cost saving attribute of reprocessed devices and solutions which is responsible for potential annual savings of USD 2 billion in U.S. health care system from reprocessing and repurchasing 2% of all medical devices and potential cost savings of almost 50% and annual savings of USD 213K by one health system from purchasing reprocessed medical devices while Stryker Sustainability Solutions works with hospitals that save over USD 1 million annually as a result of a reprocessing program. Further, the report states the major challenge is that reprocessing is complex and technical, and it raises concerns about patient safety, ethics, the environment, and costs. Risks of the reprocessed devices outweigh the benefits and that research has not proven it to be safe. Based on geography, North America dominated the global reprocessed medical devices market with the market share of 42% in 2016 followed by Europe owing to Directive 93/42/EEC concerning medical devices and distinguishes between reusable devices and those intended for single use, according to which for the reusable medical devices, the manufacturer must provide information on the appropriate process to allow reuse, including cleaning, disinfection, and packaging and, where appropriate, the method of sterilization to be used, and any restriction on the number of reuses. APAC tends to be the fastest growing reprocessed medical device market and Japan, China, Australia, Korea, Indonesia, and India owing to encouraging regulatory policies and rising pressure to keep healthcare budgets under control are expected to fuel the growth of the reprocessed medical devices market in the APAC. What is the total market size by 2024 and what would be the expected growth rate of the market? What is the revenue of Reprocessed Medical Devices in 2015-16 and what would be the expected demand over the forecast period? We can provide two-hour complimentary interaction with our analyst after the purchase of this market report. Details are imparted within the report. 8.2.2. Hygia Health Services, Inc.
8.2.7. Stryker Sustainability Solutions, Inc.